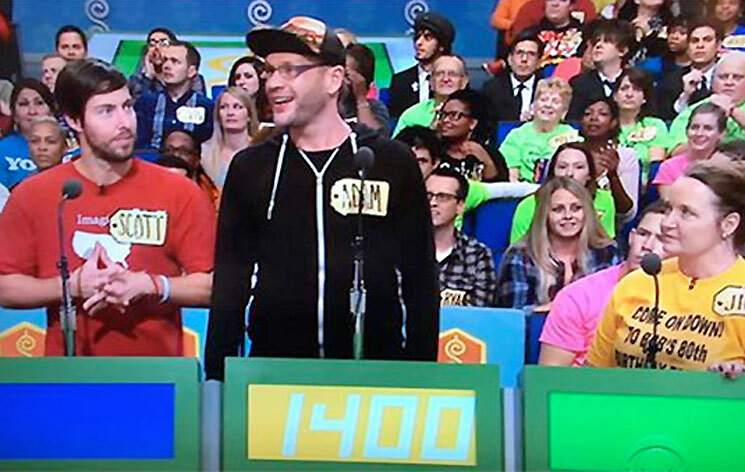 In case any of you metal fans weren't watching The Price Is Right this morning (February 10), the guy that won the whole magilla turned out to be none other than Killswitch Engage guitarist Adam Dutkiewicz. Today's episode found the metalcore six-stringer standing onstage alongside game show host Drew Carey, playing standards like the Money Game, spinning that big wheel, and eventually winning his showcase. All told, he won a car, a truck, and came out of there with prizes totalling $51,832 U.S.
Killswitch frontman Jesse Leach was making video posts of the program over Instagram all morning, which reveal highlights like Dutkiewicz accidentally breaking a microphone pack, climbing into his new lemon yellow Honda, and other moments that reveal just how stoked the metal musician was to be there. You'll find his appearance from the show down below, where you'll also find a vintage concert clip of the band walking out onstage to the jaunty sounds of The Price Is Right's familiar theme song.